Purgatory gaining Fortitude can come here." Hyoga stands inside this God's Temple asks, "You are..."
head-piece of the stick extends two wings. "Cygnus Saint Hyoga... How long will you last in this Paradise?" "What's wrong? You lost the ability to speak?" questions Hermes. Hyoga just stands there doing nothing but suddenly, there's a blaze surrounding the Cygnus Saint and a weird sound can be heard! "THAT IS CYGNUS GOD CLOTH!! ", shout Hermes in shock. [ARE WA KIGUNASU NO SHIN SEI I] Hyoga looked like he was doing nothing but actually he chose to awaken his ultimate Cloth to answer Hermes's question. "FINE THEN! TAKE THIS!! MAGIC SQUARE!!!!!!!!!!!!!!!!!!!" Massive light shines from Hermes's Wand and an image of a two- face pillar appears! The light hits Hyoga but interestingly enough nothing happens! "Well... What's wrong? ", asks Hyoga this time, "Have you lost the ability to fight?" "Ha! ", laughs the Olympus God, "Hyoga. Look down carefully at your feet..."
Hyoga wonders what those numbers mean. He is standing on the number 1. Hermes answers, "These numbers represent universal harmony. You are now trapped in this Battle Array of 15." Hyoga doesn't believe it and he launchs his Finish Blow, "DIAMOND DUST!!!!!!!!!!!!!!!!!" But ice crystals from the blow stays inside the square! What's more interesting is that the numbers 816 shines giving a immense shock to Hyoga! "UWAHHHHH!!!!!!!!!!!!!!!!!!!!! ", screams Hyoga as Hermes explains smiling, "No matter where you stand, each line of 3 numbers sum up to 15..."
Hyoga lands on the number 7. "UAHHHHHHHHH!!!!! ", screams Hyoga as the number 276 shines! "I praise you Hyoga. Most beings would have already died! Give up!! ", says Hermes as the Cygnus Saint lands on the 5. "No! I just started to fight this battle. If I lose now, I waste this God Cloth that Athena has bestowed me!!" But again, the ice crystals does not travel to the Sky Pillar God! "TAKE THE MOST POWERFUL SHOCK OF MAGIC SQUARE!! DIE!!!!!!!!!! ", shouts Hermes as the numbers 456 and 258, 951 and 357 shines! With quadruple the shock, Hyoga is blown away! His God Cloth along with his body is broken in pieces lying down on the floor! "Ha ha ha ha...", laughs Hermes silently. He was about to leave his Temple when suddenly he sees something funny. He looks carefully at the floor and he sees the decapitated head of Hyoga. HYOGA'S HEAD IS MADE OF CRYSTAL!!!!! "What's the matter, Hermes?" comes a voice. Hermes looks and Hyoga is actually standing beside the right of the square! "Do you think I launched my Diamond Dust for no reason at all... I actually created a variation of FREEZING COFFIN." Hermes finally realizes, "I... I destroyed an Ice Statue of Hyoga!" "THIS TIME IS MY TURN! HERMES!! KHOLODNYI SMERCH!!!!!!!!!!!!!!!!!!!" Temple is frozen, making it look like glass! "Do you think moves like that can...!" Hermes can't finish he realizes his index finger on his left hand is frozen. "So... That's how you escaped Magic Square. You've started to awaken the Mystic Zero... But Hyoga this is the best you can do..."
"Until you've fully awakened the Mystic Zero, you can't defeat an Olympus God like me. Even though your God Cloth is very close to the Kamui, it doesn't help you in anyway. Yes you can hurt me but with the protection I am wearing, the Kamui, you can't give me the killing blow. 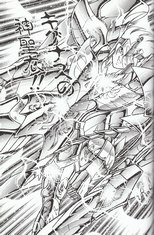 In order for you to freeze the Kamui, you have to fully manipulate the Mystic Zero!!" Hyoga is silent with nothing to say because he knows Hermes is telling the truth. "ZERO POINT ENERGY!! ", shouts Hyoga in shock, "Zero Point Energy... is the vibrational energy possessed by an atom, even at Absolute Zero!! "At Absolute Zero, we say that atoms cease motion and come to rest, but that's not true! Those atoms can never really be at rest, and the residual energy that an atom possesses at that level is the atom's Zero Point Energy!!" "That's right. As long as you have that... Ha! Glass Ceiling... You can't defeat me! But, for an Olympus God like me, reaching beyond Zero Point Energy is no trouble at all." "Hyoga... I should have taken your soul a long time ago..."
Hypnos may govern Sleep but it is I who determine where a being will go when they die." "What are you talking about? The Will of Hades and Zeus determines who goes to the Underworld and the Sky World. What do you have to do with anything?" "Ha! ", laughs Hermes, "Hyoga... What about those souls who can't enter either place...?" "Oh well... A mortal like you will never understand..."
Episode 18: The Messenger of Death and Sleep!! "ELI FANTASIA!!!!!!!!!!!!!!! ", shouts Hermes, the Sky Pillar God, the God who sees the past and the future! Eli in Hebrew means, 'God', so this blow in English is, 'God Fantasia'. From Hermes's Wand, a beam is directed beyond his Temple toward the universe, toward the Aquarius Constellation, and immediately the light bounces back and hits the ground of the Temple. With the light, a figure of a female form descends! 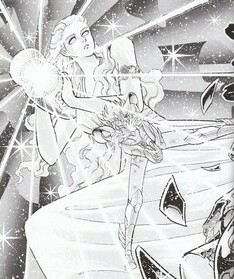 As the light dissipates, Hyoga can see a woman wearing armor, her right hand holds a wheel and her head adorns a silver crown. As the light finally disappears, her face is revealed. IT IS THE FACE OF HYOGA'S MOTHER!!!!!!!!!!!!! "She is not Natassia. SHE IS THE GODDESS OF RETRIBUTION! NEMESIS!!" "IM... IMPOSSIBLE!! ", screams Hyoga, "HOW CAN SUCH A THING HAPPEN!?" has always been the Goddess of Retribution, Nemesis!! "Hyoga... Since the day you lost your Mother... You always wanted to see her again, but you were weak. You didn't have the courage to kill yourself to join her again. Instead, you depended on other people to try to take your life... So, isn't this perfect? Your once Mother will finish what you can't do!" Hermes turns to the Goddess of Retribution and shouts, "KILL HIM!!!!!!!" The Wheel that Nemesis is holding starts to turn and powerful light rushes out toward Hyoga! "UWAHHHHHHHHHHHHHH!!!!!!!!!!!!!!!!! ", screams Hyoga. He is blown away, falls to the ground dead! Seeing this, Hermes, says, "Nemesis, you can do whatever you like with Hyoga's body..."
Hermes walks away. Nemesis kneels down and touches Hyoga's lifeless form. Even though Hyoga is dead, the warmth of Hyoga has not disappeared. Hermes was about to exit his Temple when suddenly, Nemesis groans, "HAH!" Nemesis steps back! Hyoga has actually started to stand up, slowly, trembling! "Im Impossible!! ", shouts Hermes, "How can he be alive? Is it because of his God Cloth!?" "Athena has already told us about the Spark of God!!! ", shouts Hyoga. "THE NINE SENSE!! He has yet to truly awaken the Misty Zero but somehow he is awakening the Nine Sense!!" "WHATEVER!! KILL HIM!!!!" commands Hermes again! And Nemesis releases another blast of Cosmo from her wheel! "UAHHHHHHHHH!!! ", Hyoga crashes to the ground again! But, again, he stands back up! "Why!? ", shouts Hermes, "Why doesn’t Nemesis's power work!?" "Don't you understand! Hermes! My Mother won't kill me! What little of my Mother that's left resides in Nemesis!!" "Ha! Do you think that will save you!? Even if you have awakened the Nine Sense, one more blast of Cosmo from Nemesis and you will die for sure!!" "I DON'T THINK SO!! ", shouts Hyoga as he reaches inside his Cloth for something. He lifts up an object from his neck. It is a rosary with a crucifix, the Northern Cross Rosary! 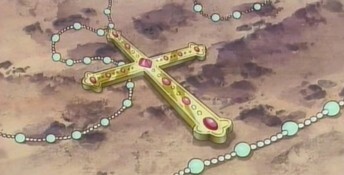 [No-zan Kurosu no Rozario] Hyoga walks in front of Nemesis and shows the Rosary to her. Seeing the crucifix, Nemesis is frozen. "Mama...", pleads Hyoga, "Do you remember this? Do you remember what you said when you gave this to me before you died? "Mama... I have always worn this and I have never lost it... but Mama! I don't need this anymore! No matter what happens, I will always remember you and you will always live in my heart! Navsegda!! [Forever] "Mama... Here... I return this back to you...!!" Nemesis has been silent all through this and can't move as Hyoga puts the Rosary around her neck. Right at the moment, Nemesis screams, "KYAHHHHHHHHHHHHHHHHH!!!!!!!!!!!!!!!!!!!" The armor, the wheel and the crown of Nemesis explodes and the form of Natassia can be seen! "MAMA!! ", cries Hyoga, rushing to hug his Mother tight! Natassia smiles and says, "Well done... My Son..."
"Mama! Finally! Mama! Finally I get to see you again. ", cries Hyoga who can't stop the tears. Natassia hugs her son close with flowing tears down her face. But suddenly, Natassia's body start to become transparent like glass! "No... Mama... I understand... I will never forget you..."
With that, Natassia disappears. Hyoga knew full well Hermes would never let her Mother stay. "DAMN IT! ", shouts Hermes angrily, "After being in touch with these mortals, Nemesis has become too attached to them, like Athena!" Hearing this, the cool Hyoga finally burns with anger but he controls it and says calmly, "Hermes... It doesn’t matter if Mother was Nemesis or Natassia, she is still my Mother, and the Mother I know, I love, would never help a God like you! Nor would she help a God like Zeus! "My Mother believed in God all her life. She did not demand anything from God nor did she blame her ill life on God. The God she knows, the God she loves would never destroy mankind. The God she knows would do anything to save mankind!" "Hah! ", groans Hermes with disgust, "Then... There's nothing to talk about..."
Hermes throws away his Wand and shouts, "But again, nothing has changed. You have yet to awaken the Mystic Zero and I have the ability of an Olympus God with full control of that technique! awakened the Eight Sense but what if all that Cold Power is thrown against you, can you survive!?" Hyoga doesn't answer instead he raises both arms above his head, holding them together, tight! He starts to burn his Cosmo beyond the way he ever burned it. "HYOGA!! DIE!! BRAVEST CYPHER!!!!!!!!!!!!!!!!!!!! ", screams Hermes! From both his clawing hands, he launches his ultimate Finish Blow! Cold Air a millions times colder than Absolute Zero, where temperatures can't really be measured are released! But right then, at the same time, from behind Hyoga, an image of a woman holding a jug appears! From that jug, a massive flow of light is released! Finally, the Cygnus Saint launches his most powerful attack! [O-RORA EKUSUKYU-SHON-----------------!!] Both Finish Blow collides!! Hermes was about to think both blows are on the same level when Hyoga suddenly rises with more Cosmo! The jug shines again and an infinite amount of Cold Power rushes to Hermes! The Olympus God's Cold Air is nothing compared to Hyoga's immense blow!! "THIS!! THIS IS MYSTIC ZERO!!!!!!!!!!!!!! GYAHHHHHHHHHHHHHHH!!!!!!!!!!!!!!" Hermes is blown, crashing few feet away, with his Kamui completely frozen! Hyoga has won and the Messenger of Death and Sleep is dead and asleep himself. With that, Hyoga walks out of Hermes Temple and never looked back once. Ikki confronts the Olympus God at Paradise of Justice! That God has foreseen the Coming of the Kaiser Cloths!! What does that mean?! And, why did Bronze Boys even wearing Gold Cloths couldn't defeat Thanatos? !